Aortic dissection (see the image below) is defined as separation of the layers within the aortic wall. Tears in the intimal layer result in the propagation of dissection (proximally or distally) secondary to blood entering the intima-media space. Mortality is still high despite advances in diagnostic and therapeutic modalities. 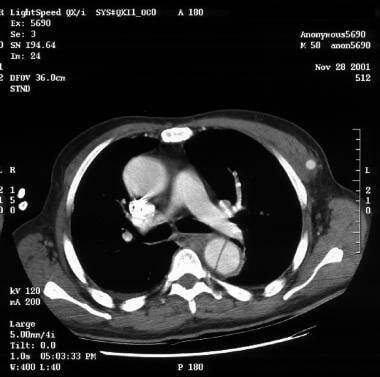 Aortic dissection can be rapidly fatal, with many patients dying before presentation to the emergency department (ED) or before diagnosis is made in the ED. Acute aortic dissection can be treated surgically or medically. In surgical treatment, the area of the aorta with the intimal tear is usually resected and replaced with a Dacron graft. Endovascular repair is emerging as the preferred treatment for descending aortic dissection. Aortic dissection is defined as separation of the layers within the aortic wall. Tears in the intimal layer result in the propagation of dissection (proximally or distally) secondary to blood entering the intima-media space. There are no validated clinical decision rules to help identify acute aortic dissection. The diagnosis is best made when there is high clinical suspicion. A good patient history and physical examination are essential, along with imaging studies, electrocardiography, and laboratory studies (see Workup). For patient education information, see the Heart and Blood Vessels Center, the Circulatory Problems Center, and the Heart Center, as well as Chest Pain. The first well-documented case of aortic dissection occurred in 1760, when King George II of England died while straining on the commode. In 1761, the celebrated Italian anatomist Giovanni Battista Morgagni provided the first detailed pathologic description of aortic dissection. Aortic dissection was associated with a high mortality rate before the introduction of the cardiopulmonary bypass in the 1950s, which led to aortic arch repair and construction. DeBakey performed the first successful operative repair in 1955. The aorta is composed of the intima, media, and adventitia. The intima, the innermost layer, is thin, delicate, lined by endothelium, and easily traumatized. The media is responsible for imparting strength to the aorta and consists of laminated but intertwining sheets of elastic tissue. The arrangement of these sheets in a spiral provides the aorta with its maximum allowable tensile strength. The aortic media contains very little smooth muscle and collagen between the elastic layers and thus has increased distensibility, elasticity, and tensile strength. This contrasts with peripheral arteries, which, in comparison, have more smooth muscle and collagen between the elastic layers. The outermost layer of the aorta is adventitia. This largely consists of collagen. The vasa vasorum, which supplies blood to the outer half of the aortic wall, lies within the adventitia. The nervi vascularis, bundles of nerve fibers found in the aortic adventitia, are involved in the production of pain, which occurs with acute stretching of the aortic wall from a dissection. The aorta does not have a serosal layer. The aorta plays an integral role in the forward circulation of the blood in diastole. During left ventricular contraction, the aorta is distended by blood flowing from the left ventricle, and kinetic energy from the ventricle is transformed into potential energy stored in the aortic wall. During recoil of the aortic wall, this potential energy is converted to kinetic energy, propelling the blood within the aorta to the peripheral vasculature. The volume of blood ejected into the aorta, the compliance of the aorta, and resistance to blood flow are responsible for the systolic pressures within the aorta. Resistance is mainly due to the tone of the peripheral vessels, although the inertia exerted by the column of blood during ventricular systole also plays a small part. The aorta has thoracic and abdominal regions. The thoracic aorta is divided into the ascending, arch, and descending segments; the abdominal aorta is divided into suprarenal and infrarenal segments. The ascending aorta is the anterior tubular portion of the thoracic aorta from the aortic root proximally to the innominate artery distally. The ascending aorta is 5 cm long and is made up of the aortic root and an upper tubular segment. The aortic root consists of the aortic valve, sinuses of Valsalva, and left and right coronary arteries. It extends from the aortic valve to the sinotubular junction and supports the base of the aortic leaflets. The aortic root allows the three sinuses of Valsalva to bulge outward, facilitating the full excursion of the leaflets in systole. The left and right coronary arteries arise from these sinuses. The upper tubular segment of the ascending aorta starts at the sinotubular junction and ends at the beginning of the aortic arch. The ascending aorta lies slightly to the right of the midline, with its proximal portion in the pericardial cavity. Structures around the aorta include the pulmonary artery anteriorly; the left atrium, right pulmonary artery, and right mainstem bronchus posteriorly; and the right atrium and superior vena cava to the right. The arch of the aorta curves upward between the ascending aorta and descending aorta. The brachiocephalic arteries originate from the aortic arch. Arteries that arise from the aortic arch carry blood to the brain via the left common carotid, innominate, and left subclavian arteries. The initial part of the aortic arch lies slightly left and in front of the trachea; the arch ends posteriorly to the left of the trachea and esophagus. Inferior to the arch is the pulmonary artery bifurcation, the right pulmonary artery, and the left lung. The recurrent laryngeal nerve passes beneath the distal arch, and the phrenic and vagus nerves lie to the left. The junction between the aortic arch and the descending aorta is called the aortic isthmus. The isthmus is a common site for coarctations and trauma. The descending aorta extends from the area distal to the left subclavian artery to the 12th intercostal space. Initially, the descending aorta lies in the posterior mediastinum to the left of the course of the vertebral column. It passes in front of the vertebral column in its descent and ends behind the esophagus before passing through the diaphragm at the level of the 12th thoracic vertebra. The abdominal aorta extends from the descending aorta at the level of the 12th thoracic vertebra to the level of bifurcation at the fourth lumbar vertebra. The splanchnic arteries branch from the abdominal aorta. The thoracoabdominal aorta is the combination of the descending thoracic and abdominal aorta. With increasing age, the elasticity and distensibility of the aorta decline, thus inducing the increase in pulse pressure observed in elderly individuals. The progression of this process is exacerbated by hypertension, coronary artery disease, or hypercholesterolemia. Histologically, the loss of distensibility is marked by fragmentation of elastin and the resultant increase in collagen and, thus, a higher collagen-to-elastin ratio. This, along with impairment in flow in the vasa vasorum, may be responsible for the age-related changes. These factors cumulatively lead to increased left ventricular systolic pressure and wall tension with associated increases in end-diastolic pressure and volume. The aortic wall is exposed to high pulsatile pressure and shear stress (the steep slope of the pressure curve; ie, the water hammer effect), making the aorta particularly prone to injury and disease from mechanical trauma. The aorta is more prone to rupture than any other vessel, especially with the development of aneurysmal dilatation, because its wall tension, as governed by the Laplace law (proportional to the product of pressure and radius), is intrinsically high. An aortic dissection is a split or partition in the media of the aorta; this split is frequently horizontal or diagonal. An intimal tear connects the media with the aortic lumen, and an exit tear creates a true lumen and a false lumen, resulting in a double-barreled aorta (see the image below). The true lumen is lined by intima, and the false lumen is within the media. Although the false lumen is within the media, suggesting that it is "lined" with media is misleading; if the aortic dissection becomes chronic, the lining becomes a serosal pseudointima. The true lumen is frequently smaller than the false lumen, but not invariably. Typically, flow in the false lumen is slower than in the true lumen, and the false lumen often becomes aneurysmal when subjected to systemic pressure. The dissection usually stops at an aortic branch vessel or at the level of an atherosclerotic plaque. The most common site of dissection is the first few centimeters of the ascending aorta, with 90% occurring within 10 cm of the aortic valve. The second most common site is just distal to the left subclavian artery. Between 5% and 10% of dissections do not have an obvious intimal tear. These often are attributed to rupture of the aortic vasa vasorum as first described by Krukenberg in 1920. 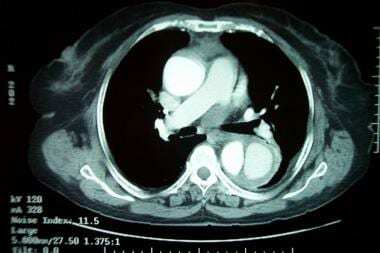 Ascending aortic involvement may result in death from wall rupture, hemopericardium and tamponade, occlusion of the coronary ostia with myocardial infarction, or severe aortic insufficiency. The nervi vascularis (ie, bundles of nerve fibers found in the aortic adventitia) are involved in the production of pain. Two major anatomic classification schemes for aortic dissection are the DeBakey and the Stanford systems (see the image below). Congenital and acquired factors, alone or in combination, can lead to aortic dissection. Aortic dissection is more common in patients with hypertension, connective tissue disorders, congenital aortic stenosis, or a bicuspid aortic valve,  as well as in those with first-degree relatives with a history of thoracic dissection. These diseases affect the media of the aorta and predispose it to dissection. Arterial hypertension is an important predisposing factor for aortic dissection. Of patients with aortic dissection, 70% have elevated blood pressure. Hypertension or pulsatile blood flow can propagate the dissection. Pregnancy can be a risk factor for aortic dissection, particularly in patients with an underlying anomaly such as Marfan syndrome. An estimated 50% of all cases of aortic dissection that occur in women younger than 40 years are associated with pregnancy. Most cases occur in the third trimester or early postpartum period. The normal aorta contains collagen, elastin, and smooth muscle cells that contribute the intima, media, and adventitia, which are the layers of the aorta. With aging, degenerative changes lead to breakdown of the collagen, elastin, and smooth muscle and an increase in basophilic ground substance. This condition is termed cystic medial necrosis. Atherosclerosis that causes occlusion of the vasa vasorum also produces this disorder. Cystic medial necrosis is the hallmark histologic change associated with dissection in those with Marfan syndrome. Cystic medial necrosis was first described by Erdheim in 1929. Sources disagree over the accuracy of this term in elderly patients because the true histopathologic changes are neither cystic nor necrotic. Researchers have used the term cystic medial degeneration. Early on, cystic medial necrosis described an accumulation of basophilic ground substance in the media with the formation of cystlike pools. The media in these focal areas may show loss of cells (ie, necrosis). This term still is used commonly to describe the histopathologic changes that occur. 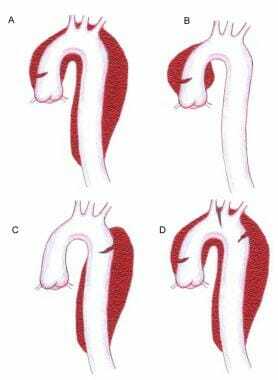 Aortic dissection occurs when the layers are split in the process of cannulation or aortotomy. In the United States, aortic dissection is an uncommon disease. The true frequency of aortic dissection is difficult to estimate, and most estimates are based on autopsy studies. Evidence of aortic dissection is found in 1-3% of all autopsies (1 in 350 cadavers). The incidence of aortic dissection is estimated to be 5-30 cases per 1 million people per year. Aortic dissection occurs once per 10,000 patients admitted to the hospital; approximately 2000 new cases are reported each year in the United States. Aortic dissection is more common in blacks than in whites and is less common in Asians than in whites. Also, it is more common in males than females, with a male-to-female ratio of 2-3:1. Approximately 75% of dissections occur in those aged 40-70 years, with a peak in the range of 50-65 years. Patients with Marfan syndrome present earlier, usually in the third and fourth decades of life. Hospital-based mortality for aortic dissection is approximately 30%. Patients with type A aortic dissection who undergo surgical treatment have a 30% mortality; patients who receive medical treatment have a 60% mortality. Comorbidities and advanced age can pose a contraindication to surgery in selected patients. Medically treated patients with type B dissection have a 10% mortality; surgically treated patients with type B dissection have a 30% mortality. An acute aortic dissection (< 2 weeks) is associated with high morbidity and mortality (highest mortality in the first 7 days). From 1% to 2% of patients with aortic dissection die per hour for the first 24-48 hours. Patients with chronic aortic dissection (>2 weeks) have a better prognosis.